Many people who have visited All Saints Church will have seen the beautiful altar kneeler made to commemorate the Millennium. Worked by several volunteers it was designed by Mary Johnson. 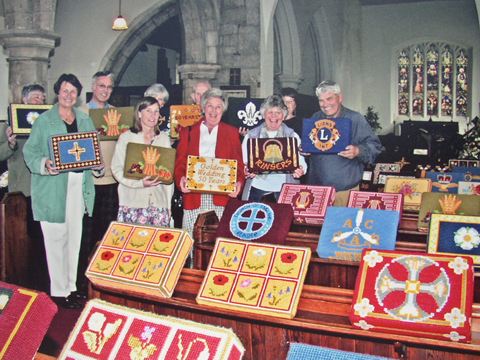 As a result of this a Kneeler and Pew Cushion Project was started in September 2003 by two ladies of the church to extend the furnishing of kneelers (also known as Hassocks) into the choir and nave. Appeals were made asking for help with the stitching, funding or supporting in any way and for donations of kneelers, the working of which was described as a pleasurable and relaxing hobby that may be carried out independently or in small groups. People were invited to a friendly informal meeting to discuss the setting up of the project. The meeting was well attended and the project successfully launched. Regular support group meetings were held for those making kneelers, or who were involved in any way, to go along for help and advice with their work or just a friendly chat and a cuppa. The Group went on an organised outing, with lunch included, in February 2004 to visit three churches, Morton, Upton and Stow, who were doing or who had completed similar projects. Fundraising has included a 3 course lunch held in the Recreation Room in April 2004 to which 35 people attended raising over £200. 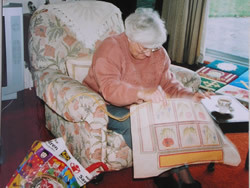 A dedicated team of ladies and three gentlemen spent many hours of their time making some beautiful kneelers of varying designs, either of their own, or have completed kneelers donated by other people. 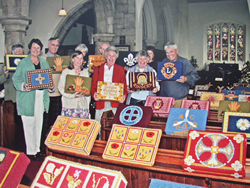 Most of them have a permanent label attached with details of who donated the kneeler, who stitched it and to whom it is dedicated, making them a lasting memorial to a loved one as well as a practical item. 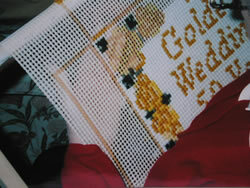 A service of dedication for the finished kneelers was conducted by Reverend Derek Hollis in May 2004 and they were displayed in the Church for the Beckingham Church Fair in the summer of that year for all to see. 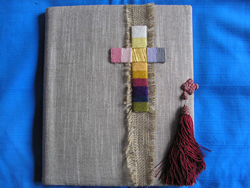 A wonderful kneeler project book with a beautiful cover has been put together by the project leaders and a member of the church has made a wood and glass display case so that it may be exhibited in the church. The Kneeler Project Group has ceased to exist, but there are room for more kneelers in the church. If anyone would like to make one or donate one to be made please contact Caroline on 848728 or Jayne on 848468 There are many different designs to choose from or you can design your own.